Hanoi (VNA) – Foreign Minister Pham Binh Minh and Angolan Minister of External Relations Georges Rebelo Pinto Chikoti have agreed to continue seeking specific measures to strengthen ties in prioritised areas and expand affiliation in other promising fields like agriculture, health care, oil and gas, and telecommunications. During their talks in Hanoi on April 25, they concurred that the countries should also work closely together to speed up the execution of signed agreements, while promptly negotiating to sign new deals to create a legal framework for bilateral partnership. 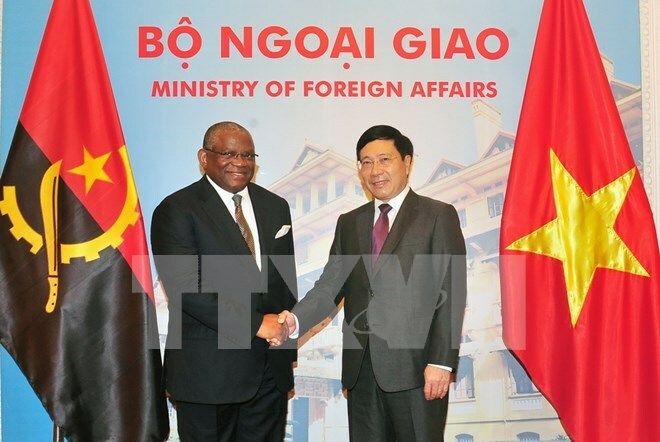 Lauding the first visit of the Angolan minister, Minh, who is also a Deputy Prime Minister, described the visit as a vivid evidence of the friendship and cooperation between the two countries in general and the two foreign ministries in particular. The Angolan official praised the achievements that Vietnam has gained during its reform and national development. He expressed his hope that Angola and Vietnam will continue to beef up their ties in areas of shared demand and strengths such as agriculture, education, health care, telecommunication and oil and gas. Meanwhile, Minh affirmed that Vietnam attaches great importance to fostering ties with traditional friends in Africa, while considering Angola a major cooperation partner in the region as well as the South Sahara region.